On small plate, spread out sugar. Moisten rim of each of six wine goblets or pilsner glasses with the citrus wedge; invert glass onto sugar to decoratively frost the rim. For each drink, tilt glass and slowly pour in champagne until the glass is half full. Hold a small spoon upside-down over the center of glass, being careful not to disturb the sugar frosting. 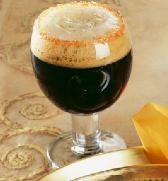 Slowly pour Chocolate Stout Beer over the spoon to evenly disperse the flow and control the foaming head. The head of beer should stop just below the frosted rim of the glass.